Polish Obsessed: A Winners Polish Win! Today I have an exciting find I was not expecting at all during my last trip to Winners. I actually headed there on a whim since I was early for a bus on my way home from work Monday. I can usually expect to find, Color Club, China Glaze, OPI and Essie among other well known polish brands. 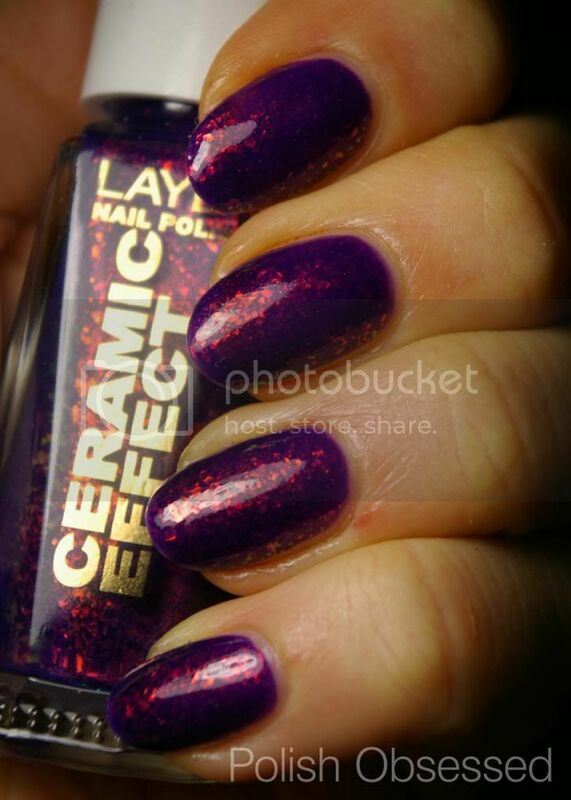 But when I saw a Layla Ceramic Effect polish I got super excited! Unfortunately there was only one, luckily for me it was a flakie! Layla Ceramic Effect 52, "The Butterfly Effect", is a gorgeous flakie comprised of a blurple jelly base, multi-chromatic shimmer and opalescent flakies. 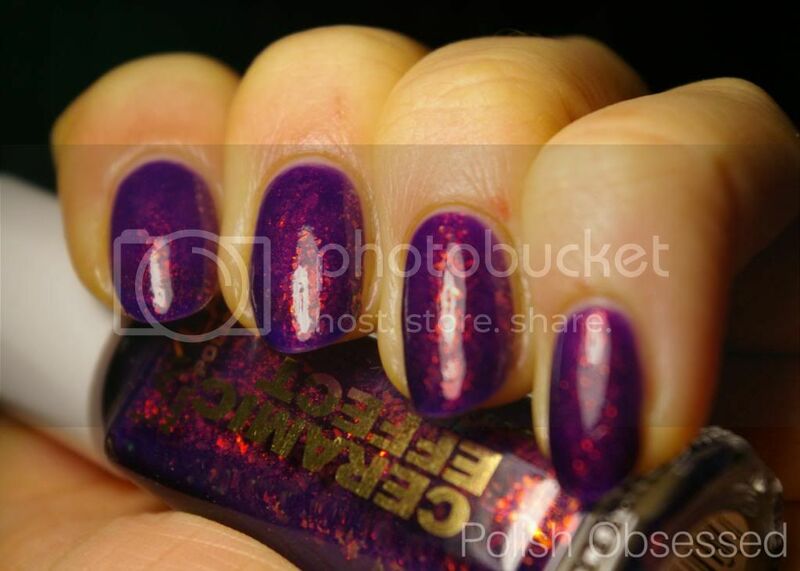 This polish is a stunner! 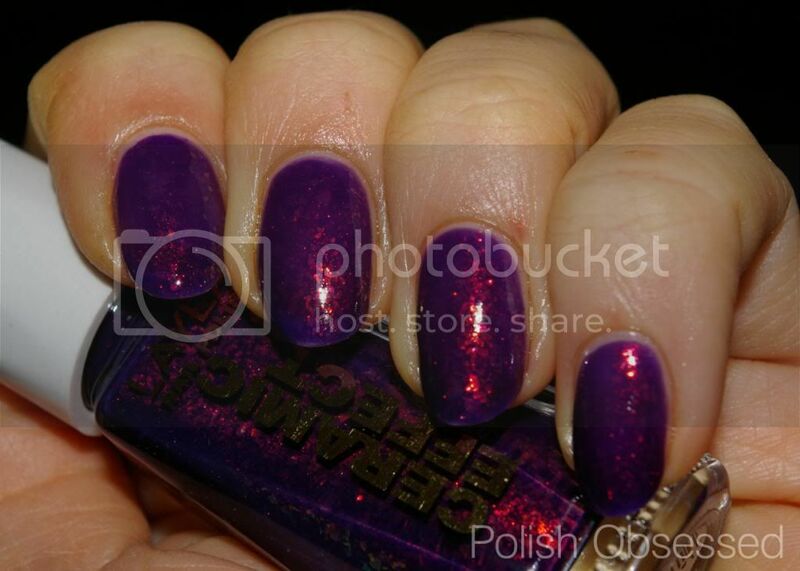 It is actually very close to another limited edition hard to find polish in my collection, Nfu-Oh 51. Side by side in the bottle they appear to have slight differences, but I think I will dedicate a separate post for the comparison for another time. First let's talk about the bottle, the only Layla's I currently own are the holographics that come in the short round bottles. The Ceramic Effects come in a tapered, tall rectangular bottle with angled corners. 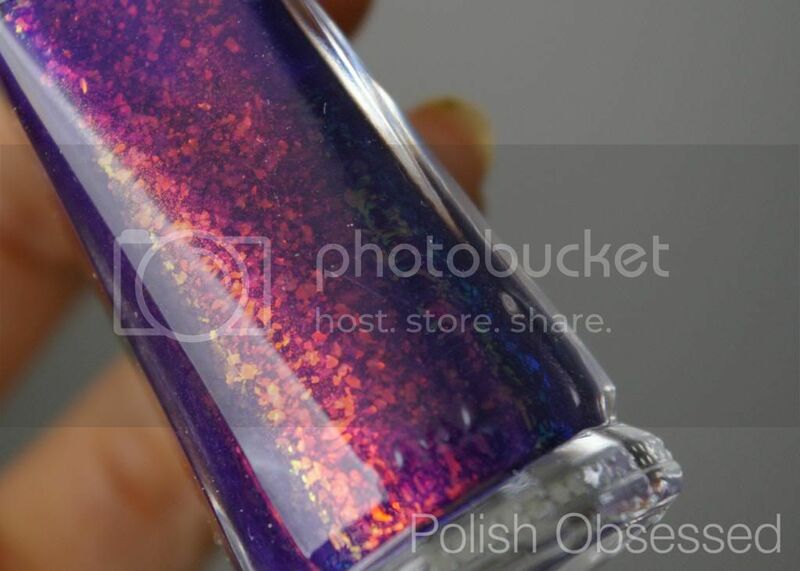 An interesting shape for a polish bottle but easy to store in my opinion! The brush handle also appears to be made of actual ceramic. Application was a breeze, no issues at all. Since the base is a jelly the first coat was a bit sheer and slightly patchy, but the second coat evened that right up! The lighting in some of my photos makes the polish apper sheer, but it reality the base is dark enough to avoid any visible nail line. The purple base is almost electric, is is dark but is so saturated I want to describe it as bright. The flakies colours shift between green, yellow orange and red along with the shimmer particles. Such a pretty shade, I'm not sure if it is readily available for a lot of people, seeing as it is an Italian brand. I checked their site and saw that they still have it for sale. I wish Winners had more, there is a green flakie Ceramic Effect I have been lusting after! We're lucky on the east coast with Lawtons carrying Layla. The flakie line however was available for a short time. I grab backups and backups when they were cleared out. Butterfly Effect was the best of them all! I envy how they are readily available to you, and on clearance too!!! I have never seen the ceramics line in Canada until I found this polish. I saw Ulta across the boarder clearing some of their Layla ceramics in late January, but none were worth picking up.